Mumbai, 25th July 2018: smartwater, the premium water brand from Coca-Cola India, in association with Lakmé Fashion Week (LFW) announced winners of ‘The Platform’, a programme to identify and mentor upcoming designers. Ishanee Mukherjee and Anirudh Chawla of ‘Poochki’, Sakshi & Swasti Shah of ‘Shanti’ and Kanika Goyal of ‘Kanika Goyal Label’ emerged as winners after two competitive rounds. The winners will be mentored by some of the industry’s most prominent fashion experts and will showcase their collections at the upcoming edition of Lakmé Fashion Week Winter Festive in August. ‘The Platform’ by smartwater aims to inspire young and innovative designers of India to think differently and showcase their creativity at Lakmé Fashion Week. ‘The Platform’ saw over 100 applications from talented designers across the country. The collections presented by each designer were an interpretation of smartwater’s core theme ‘Inspired By Clouds’, in the form of texture, fabric, shapes or colour. Inspired by the origin story of smartwater, developed on the tenets of innovation, risk taking and forward thinking, ‘The Platform’ aims to unearth talent that knows no boundaries. Announcing the winners, Anoop Manohar, GM Marketing, Coca-Cola India said, “We are very encouraged by the wonderful response received by smartwater presents ‘The Platform’, just in its maiden season. This simply reflects the need for such initiatives, to lend the much-needed impetus to the enormously talented new generation of designers – who are fearless and willing to push the boundaries of conventionality. Heartiest congratulations to the 3 winners. 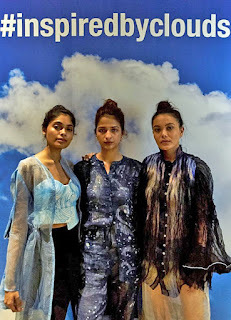 We are looking forward to the ‘Inspired by Clouds’ collection designed by them for the main showcase at the Lakme Fashion Week this August”. The designers were handpicked by an esteemed panel from diverse backgrounds of the fashion fraternity at a jury meeting that took place in Mumbai on 23rd July 2018 at Bombay Canteen, Kamla Mills. The jury comprised Payal Khandwala- designer, Tina Tahiliani – Director, ENSEMBLE, Nonita Kalra – Editor, Harper’s Bazaar, Sheetal Mallar – photographer and former model, Anoop Manohar - GM Marketing Coca-Cola India and Jaspreet Chandok – Vice President and Head of Fashion, IMG Reliance. The application and selection process comprised of two phases. The first phase was the application process where the applicants registered on the Lakme Fashion Week website, followed by submission of their power point presentations with their label information, Moodboard, Previous collection images and picture of their design. The second phase was the selection process where the esteemed jury made the final selection based on the designers’ quality, innovation, marketability, originality and ability to legitimately take their business to the next level.